The KULTURisk methodology was applied to diverse European case studies to evaluate the social and economic benefits of risk prevention, i.e. reduction of potential flood losses due to the implementation of prevention measures. - the implementation of early warning systems can significantly (between 30 and 40%, depending on various factors) reduce the potential flood damage in the Danube river basin countries indicating that investments in preparedness and early warning systems can be highly beneficial. - In the Ubaye Valley (France), it was found out that a combination of structural and non-structural prevention measures can remarkably reduce the potential impact of flooding in Barcelonnette for different receptors (70% less for people, 84% for buildings, 77% for infrastructures, 91% for agriculture). 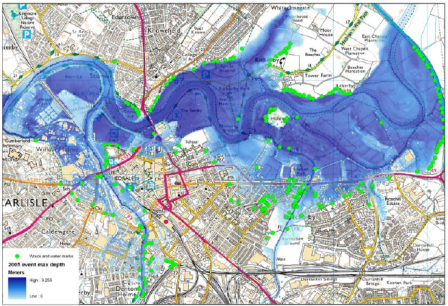 - In Zurich (Switzerland), prevention measures reduce the potential damage caused by extreme flood events in the Sihl River by 50%, while additional prevention options in Zurich (e.g. discharge tunnel) were found to potentially reduce flood losses near zero with benefits more than 10 times higher than the costs of prevention measures. Presentations of the 3rd KULTURisk workshop We are happy to announce that the presentations given at the 3rd KULTURisk workshop are available online. This workshop, organised by our partner CORILA, was entitled 'Benefits of disaster prevention measures: consolidating and widening an innovative risk assessment methodology', and it was held in Venice, from 19 to 20 September 2013.The presentations can be found in the CORILA website. The KULTURisk project aims at developing a culture of risk prevention by means of a comprehensive demonstration of the benefits of prevention measures. "Modern society has distinct advantages over those civilizations of the past that suffered or even collapsed for reasons linked to water. We have great knowledge, and the capacity to disperse that knowledge to the remotest places on earth. We are also beneficiaries of scientific leaps that have improved weather forecasting, agricultural practices, natural resources management, disaster prevention, preparedness and management…But only a rationale and informed political, social and cultural response – and public participation in all stages of the disaster management cycle – can reduce disaster vulnerability, and ensure that hazards do not turn into unmanageable disasters"